When curry is on the menu, you’ll want a delicious low-carb side dish like this Indian Cauliflower Rice. 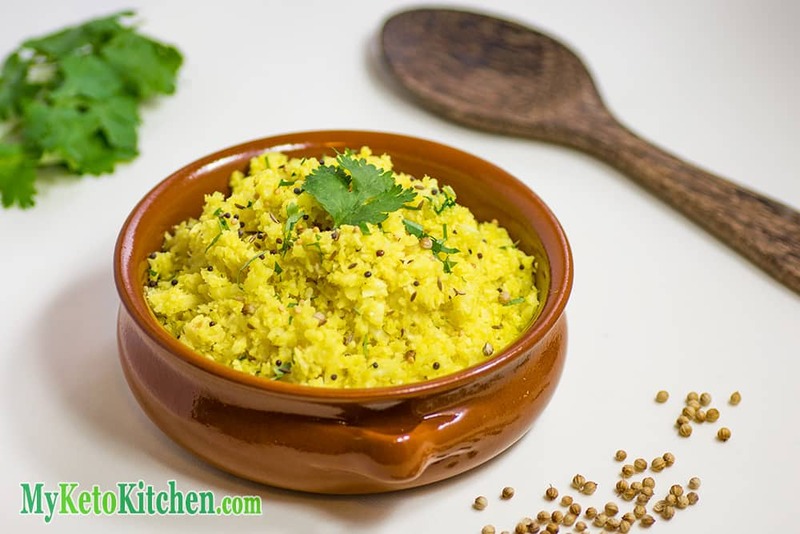 The whole spices in Indian cauliflower rice are essential to making this keto side dish a roaring success. Each bite yields little bursts of flavor as you chew the spices between your teeth. 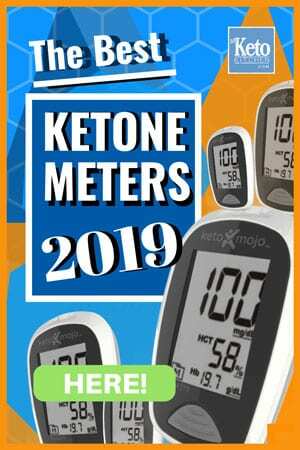 Making this delicious Indian dish an interesting addition to your keto cooking repertoire. We served this with our delicious Indian korma recipe, and they are a match made in curry heaven. It goes perfectly with our other low-carb curry dishes as well. This recipe makes six generous side serves of Fragrant Indian Cauliflower Rice. Place the ghee into a large non-stick frying pan over medium-high heat. Add the garlic and ginger and saute on the stove until fragrant. Add the whole spices and saute for 3-5 minutes, until making “popping” noises. Add half of the cauliflower rice and gently mix into the spices and ghee. Saute for another 3 minutes before adding the remaining cauliflower rice. Add the pepper and salt to taste. Continue to stir the cauliflower rice while cooking for another 8-10 minutes, until softened and cooked through. Remove the frying pan from the heat and mix through the cilantro. 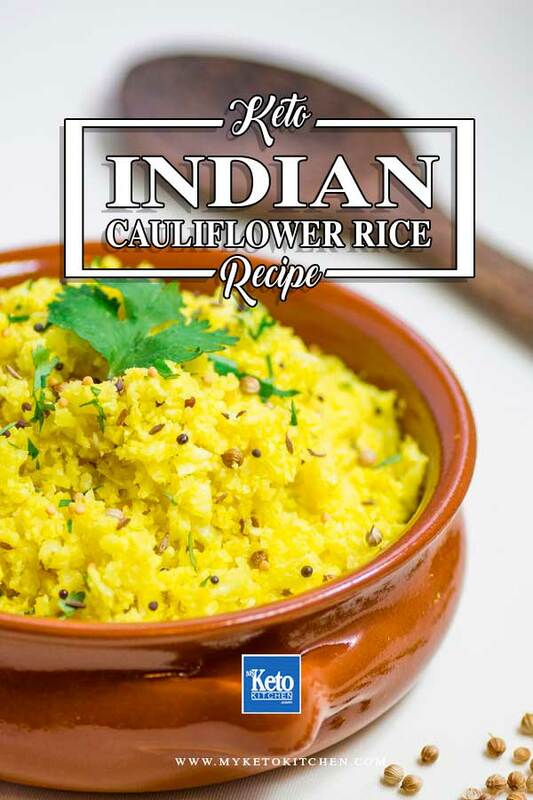 Indian cauliflower rice goes with most curry dishes such as vindaloo. When an Indian curry is on the menu, what flavor Cauliflower Rice are you going to make? Our Fragrant Indian Cauliflower Rice is the perfect addition to your meal. Add the garlic and ginger and saute until fragrant. Add half of the cauliflower rice and gently mix into the spices and ghee. Saute for 3 minutes before adding the remaining cauliflower rice. 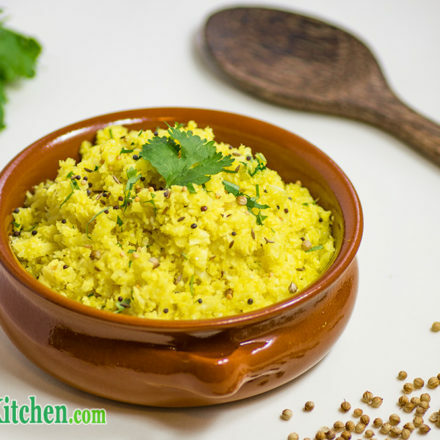 To make a larger batch of fragrant low carb Indian cauliflower rice adjust the serving amount in the recipe card above.